Customers, who bought laptops with the new operating system Windows 8, said that on the bottom side of the device there is no sticker with the Product key of Windows 8. Many users at the same time wondered how to implement reinstall OS without Product key of Windows 8? The answer to this question is quite simple. 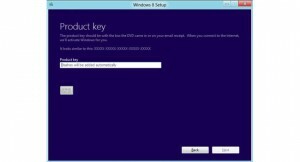 Product key of Windows 8 is burnt into the motherboard BIOS. Thus, when you reinstall the operating system the user does not need to enter it in the box manually, the code will be automatically gets from the BIOS to use during the installation and activation. This procedure has several advantages for Microsoft, OEM-system builders and end users. So, now the attackers has more difficulty to steal the key, users in the installation process does not have to manually enter the code, and worry that the in-service information on the label will come in the form unreadable. However, this solution has some challenges. Thus, the user may have difficulty if he wants to install a different version of the laptop operating system. For example, if you purchase a pre-installed version of Windows 8, then when you try to install Windows 8 from Pro BIOS will automatically retrieve the code corresponding to the previous version, which will not allow the user to enter a new code. There are other issues as well: how to reinstall the OS after replacing the motherboard, how to update BIOS, so as not to overwrite the key, as will subsequently be upgraded to Windows 9? This was all regarding Product key of Windows 8, if you has brought the new Windows 8 device and searching the key on the box of your device, don’t worry as it is hidden in the bios of your device.